NECTAR: What’s in it for me? NECTAR, the university’s open access institutional repository, is now entering its eighth year, with deposits of both bibliographic data and full content going from strength to strength. But what does this mean to the individual researcher? In the rush to enter details for this report or that, it is easy to overlook the fact that having one’s research outputs in NECTAR delivers a range of benefits. 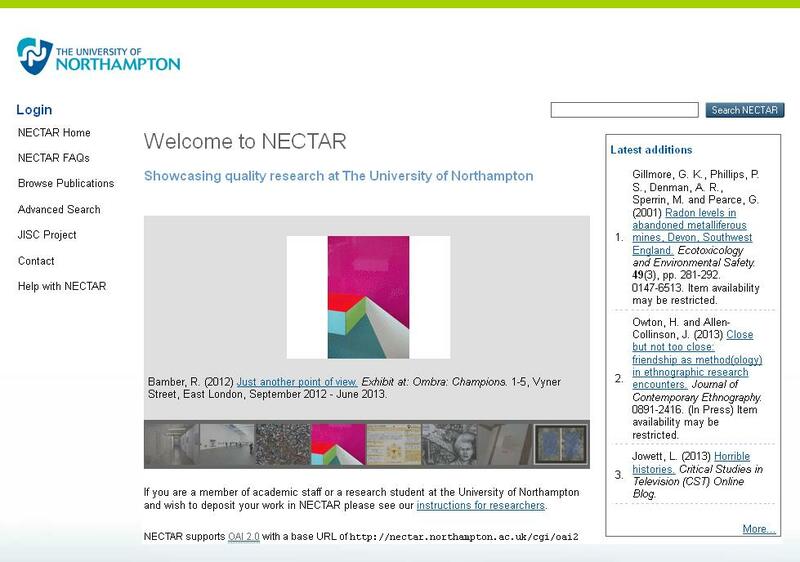 NECTAR items have high quality and comprehensive metadata, including links to related web sites and pages. Your NECTAR items can have links to your personal or research group websites, or to conferences, galleries, news items, reviews of your work, and other related websites. This will help you to contextualise your work and demonstrate its impact. You can upload both text and non-text outputs – including sound, image and multi-media files. Multiple files can be attached to a single NECTAR item, enabling you to include supporting documents and other files with your work. NECTAR items are indexed by both specialist and general search engines. Your work is discoverable by a wider audience, including potential collaborators, publishers, venues and conference organisers. NECTAR content is permanently available. NECTAR’s perpetual web addresses can be shared with colleagues and linked to from personal or departmental web pages and social media. You can easily generate personal research outputs lists (CVs). Your University staff profile has an automatic feed from NECTAR and is updated whenever a new item is made live in the repository. Preservation – NECTAR content is stored securely. Where possible, NECTAR content will be migrated to ensure compatibility with future file readers. NECTAR is used as the basis of a range of research reports – for individuals, Divisions, Schools and the University. Win recognition for yourself or your research group in the University’s Quarterly and Annual Research Reports. The NECTAR team have access to a range of different usage statistics. We can tell you how frequently your items are visited and how often your work is downloaded. Contact Nick Dimmock for further information. Posted on January 21, 2014, in Library and tagged benefits, NECTAR, open access. Bookmark the permalink. 1 Comment.